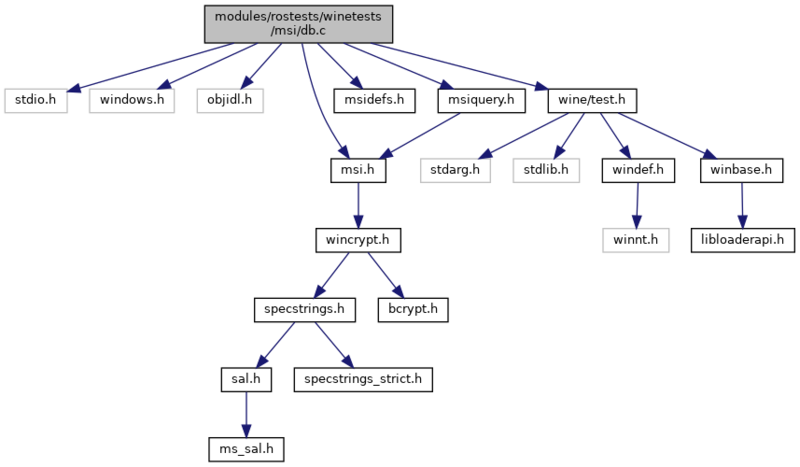 static const char * msifile = "winetest-db.msi"
static const char * msifile2 = "winetst2-db.msi"
static const char * mstfile = "winetst-db.mst"
Definition at line 307 of file db.c. Definition at line 291 of file db.c. Definition at line 296 of file db.c. Definition at line 300 of file db.c. Definition at line 304 of file db.c. Definition at line 21 of file db.c. Definition at line 1582 of file db.c. Definition at line 2822 of file db.c. Definition at line 3036 of file db.c. Definition at line 277 of file db.c. Definition at line 2239 of file db.c. Referenced by test_msiimport(), and test_suminfo_import(). Definition at line 1302 of file db.c. Referenced by test_integers(), test_msiimport(), test_storages_table(), test_streamtable(), test_viewgetcolumninfo(), test_where(), and test_where_not_in_selected(). Definition at line 266 of file db.c. 269 "CREATE TABLE `Binary` ( "
270 "`Name` CHAR(72) NOT NULL, "
271 "`Data` CHAR(72) NOT NULL "
Definition at line 204 of file db.c. 207 "CREATE TABLE `Component` ( "
208 "`Component` CHAR(72) NOT NULL, "
210 "`Directory_` CHAR(72) NOT NULL, "
211 "`Attributes` SHORT NOT NULL, "
Definition at line 219 of file db.c. 222 "CREATE TABLE `CustomAction` ( "
223 "`Action` CHAR(72) NOT NULL, "
224 "`Type` SHORT NOT NULL, "
Definition at line 1173 of file db.c. Referenced by test_alter(), test_columnorder(), test_createtable(), test_getcolinfo(), test_handle_limit(), test_insertorder(), test_join(), test_markers(), test_order(), test_select_markers(), test_select_with_tablenames(), test_storages_table(), test_streamtable(), test_temporary_table(), test_viewgetcolumninfo(), test_where(), and test_where_not_in_selected(). Definition at line 232 of file db.c. 235 "CREATE TABLE `Directory` ( "
236 "`Directory` CHAR(255) NOT NULL, "
238 "`DefaultDir` CHAR(255) NOT NULL "
Referenced by create_package_db(), and test_dbtopackage(). Definition at line 244 of file db.c. 247 "CREATE TABLE `FeatureComponents` ( "
248 "`Feature_` CHAR(38) NOT NULL, "
249 "`Component_` CHAR(72) NOT NULL "
Definition at line 1561 of file db.c. Referenced by test_binary_import(), test_dbmerge(), and test_forcecodepage(). Definition at line 3123 of file db.c. Definition at line 255 of file db.c. 258 "CREATE TABLE `StdDlls` ( "
259 "`File` CHAR(255) NOT NULL, "
260 "`Binary_` CHAR(72) NOT NULL "
Definition at line 7480 of file db.c. Definition at line 147 of file db.c. Referenced by test_binary(), test_binary_import(), test_columnorder(), test_dbmerge(), test_droptable(), test_embedded_nulls(), test_integers(), test_msiimport(), test_msiinsert(), test_temporary_table(), test_try_transform(), and test_where(). Definition at line 6192 of file db.c. Definition at line 2862 of file db.c. 2932 query = "CREATE TABLE `Property` ( `Property` CHAR(72) NOT NULL, "
Definition at line 3038 of file db.c. Definition at line 1252 of file db.c. Referenced by test_storages_table(), test_streamtable(), and test_viewgetcolumninfo(). Definition at line 1271 of file db.c. Definition at line 3147 of file db.c. Definition at line 7208 of file db.c. Definition at line 172 of file db.c. Referenced by add_entry(), create_binary_table(), create_component_table(), create_custom_action_table(), create_directory_table(), create_feature_components_table(), create_std_dlls_table(), generate_transform(), test_alter(), test_binary(), test_carriagereturn(), test_collation(), test_columnorder(), test_dbmerge(), test_deleterow(), test_droptable(), test_forcecodepage(), test_insertorder(), test_join(), test_markers(), test_noquotes(), test_order(), test_quotes(), test_rows_order(), test_select_markers(), test_select_with_tablenames(), test_special_tables(), test_streamtable(), test_stringtable(), test_tables_order(), test_temporary_table(), test_try_transform(), test_update(), test_viewgetcolumninfo(), test_viewmodify(), test_viewmodify_assign(), test_viewmodify_delete(), test_viewmodify_delete_temporary(), test_viewmodify_refresh(), test_viewmodify_update(), test_where(), test_where_not_in_selected(), and test_where_viewmodify(). Definition at line 188 of file db.c. Definition at line 3079 of file db.c. Definition at line 9704 of file db.c. Definition at line 4183 of file db.c. Definition at line 1835 of file db.c. Definition at line 2587 of file db.c. Definition at line 6824 of file db.c. Definition at line 5121 of file db.c. 5161 query = "CREATE TABLE `bar` ( "
5162 "`foo` LONGCHAR NOT NULL, "
5163 "`baz` LONGCHAR NOT NULL "
5171 r = run_query(hdb, 0, "INSERT INTO `bar` "
5175 r = run_query(hdb, 0, "INSERT INTO `bar` "
Definition at line 8825 of file db.c. 8856 query = "CREATE TABLE `T` ( `B` SHORT NOT NULL, `C` SHORT NOT NULL, "
8857 "`A` CHAR(255), `E` INT, `D` CHAR(255) NOT NULL "
8938 query = "INSERT INTO `T` ( `B`, `C`, `A`, `E`, `D` ) "
9082 query = "CREATE TABLE `Z` ( `B` SHORT NOT NULL, `C` SHORT NOT NULL, "
9083 "`A` CHAR(255), `E` INT, `D` CHAR(255) NOT NULL "
9164 query = "INSERT INTO `Z` ( `B`, `C`, `A`, `E`, `D` ) "
Definition at line 9312 of file db.c. Definition at line 7979 of file db.c. 8043 query = "CREATE TABLE `One` ( "
8046 "`C` CHAR(64) LOCALIZABLE, "
8048 "`E` CHAR(72) NOT NULL, "
8049 "`F` CHAR(56) NOT NULL, "
8050 "`G` CHAR(64) NOT NULL LOCALIZABLE, "
8051 "`H` LONGCHAR NOT NULL "
8056 query = "CREATE TABLE `One` ( "
8061 "`E` CHAR(64) NOT NULL, "
8062 "`F` CHAR(64) NOT NULL, "
8063 "`G` CHAR(64) NOT NULL, "
8064 "`H` CHAR(64) NOT NULL "
8391 query = "CREATE TABLE `One` ( "